Follow John Watkinson (w/Robinson, Cordia and Amara) through this step-by-step video tutorial and learn how to make the best 3D anaglyph images. Unlike most of these kinds of still images that we've been able to find, John's method gives the illusion of fully modeled space, w/parts of the image appearing to protrude out, into space, other parts at approximately the middle ground (or image/screen plane) and other areas behind and even deep in the background. A key to enhancing this effect is to compose your subjects so that there is an obvious sense of perspective, or deep space, in your set up, keep the main subject and background people steady (movement from one frame to the next will obscure the effect--still life compositions are easier, but less dramatic), and use lots of light, but not the flash (the flash will create harsh shadows from 2 different angles when you move the camera--you need the lighting to be consistent even if the camera angle isn't). Also, even though you only need two images to combine into the final product, you might take several sets of 2 as there's still an element of hit or miss in this process. Don't get discouraged if it takes a few tries to get a good grouping of images. You'll get it sooner than you think. You also want to keep track of which shot is the left eye angle and which is the right. That will be important when you composite the pictures in Photoshop. And it all goes better w/Mos Def. It's all in the video. Enjoy, and have fun making some anaglyph images of your own. AND PLEASE UPLOAD OR LINK TO YOUR RESULTS IN THE COMMENTS FIELD. 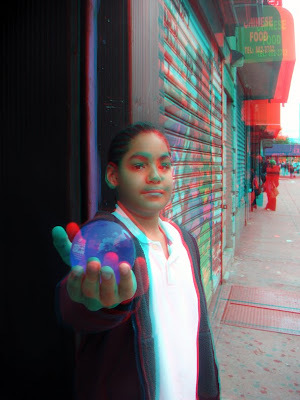 How to Make a 3D Anaglyph Image from Computer Clubhouse on Vimeo.